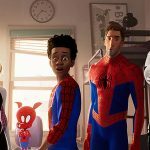 Joyce Glasser reviews Incredibles 2 (July 13, 2018) Cert. PG, 125 min. Unlike most of the other superhero franchises, when Incredibles was released fourteen years ago, it was a personal triumph for writer/director Brad Bird, Pixar’s first outside director, whose previous movie, the critically acclaimed The Iron Giant, had lost money at the box office. It was not only personal because Bird provides the voice of costume designer to the superheroes, Edna Mode (which he does in this sequel) and that his son Michael voiced Violet’s boyfriend (which he also does in the sequel); or that the characters of Syndrome and Mr Incredible are based on Bird’s likeness. It was because the film is about a family and Bird, with his own family, is no more a 9-to-5 man than is Bob Parr (Craig T. Nelson). If Bob possesses super human strength and is nearly indestructible in his crime busting, Bird possesses incredible talent and works long hours when offices are closed. 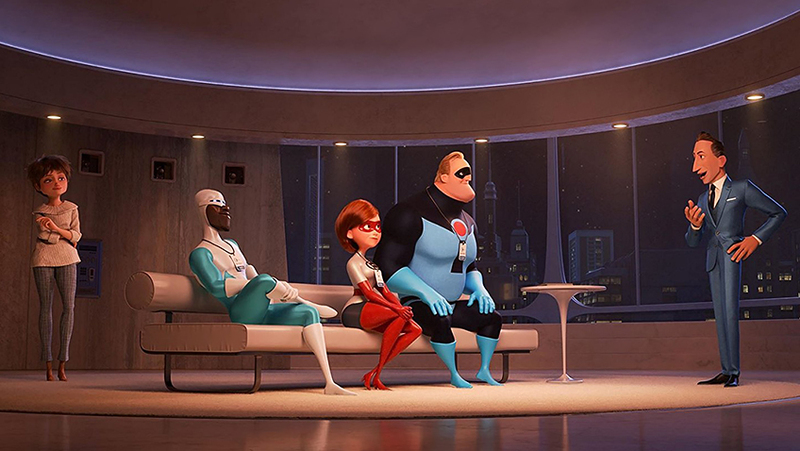 When the original Incredibles begins, Bob and his wife Helen, or Elastigirl (Holly Hunter) – for her ability to stretch her body into all shapes and sizes – are raising a family, but are bored with life in suburban Metroville (San Francisco). Being in the Superhero Relocation Programme prevents Bob from doing the job he loves. 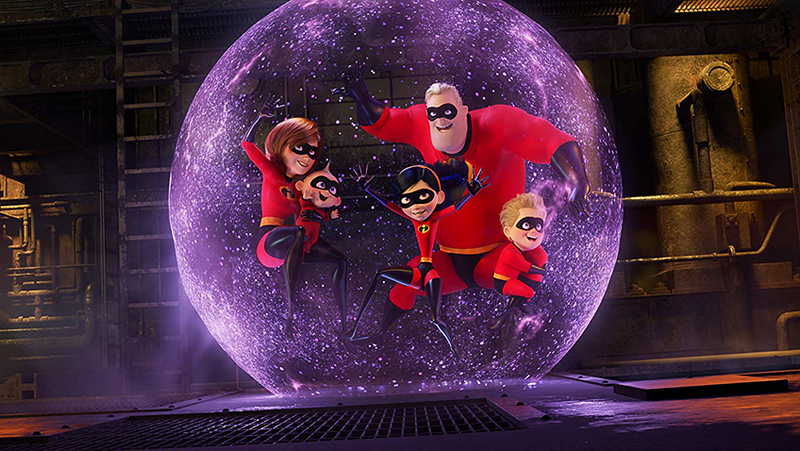 Along with the marvellous animation, it was this family setting, the characters with whom we could identify and the intrigue of the secretive nature of their powers and jobs, that made Incredibles the favourite superhero movie of people who aren’t fans of the genre. A financial success, it won the Best Animated Feature Academy Award. This was one film where a sequel was not only obvious, but desirable. Yet – or perhaps because of the personal nature of the film, no sequel was forthcoming. Fans went on to admire Bird’s Ratatouille (2007) – and Bird’s second Academy Award, and his impressive Mission: Impossible – Ghost Protocol (2011). Now Bird is back as writer/director of Incredibles 2 , along with four of the key original cast and composer Michael Giacchino. Is the thrill and magic still there? The sequel begins a short time after original left off. The Parr family are slowly regaining the public trust and cannot resist going after the Underminer (John Ratzenberger) who has robbed Metroville’s Bank and escaped. In a well-choreographed opening action sequence, Bob, Helen and their friend Lucius Best, AKA the ice-forming Frozone (Samuel L. Jackson, terrific) stop the Underminer’s deadly drill from flattening City Hall, but their pursuit of the evasive Underminer leaves an expensive wake of destruction. Rick Dicker (Jonathan Banks), the Parrs’ sympathetic contact at the Superhero Relocation Programme, breaks the news. The government has cut off the funding that they have been receiving for the past fifteen years. The best he can offer them is two weeks in a motel to get their lives in order. Just when the situation looks hopeless, in steps Winston Deavor, a plugged in superrich superhero fan. 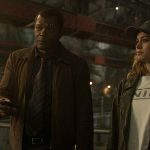 Winston, and his sister Evelyn (Catherine Keener) own DevTech, a telecommunications company that plans to promote the cause of the superheroes and change public opinion. Deavor, by the way, is voiced by Bob Odenkirk who also saved the day as reporter Ben Bagdikian in Steven Spielberg’s The Post. Winston chooses the more reliable and efficient Helen to perform the first publicity stunt, although Evelyn the real brains behind DevTech and inventor of its technology, probably had a say in this choice, which effectively divides the couple. Bob is not happy about being sidelined to become a temporary house dad, but he has to make the best of it, and pretends that he’s in control. While Helen is having a blast saving people trapped in a runaway train, Bob struggles to help Dash (Huck Milner) with his maths homework and teenager Violet (Sarah Vowell) with her boyfriend conundrum, while preventing their rambunctious toddler Jack-Jack (Eli Fucile) from destroying their home with his burgeoning superpower skills. When Helen learns that she was off working when Jack-Jack manifested his multi-faceted skills, it is like a mother who has missed her child’s first steps or words. But that’s later. After the initial glory of the train stunt, Helen’s much tougher task is to identify a mysterious villain called Screenslaver (Bill Wise) who hypnotises people through television screens. Superheroes, as she soon learns, are not immune and can be manipulated to act like villains rather than heroes. Who is this malignant cancer that seems intent on undermining Winston’s campaign and what can be done to stop an invisible enemy? Even for animation, the action sequences are mind-bogglingly impressive and show how technology has evolved, since 2004 when Incredibles was already a technological and creative marvel. The family dynamic is still at the core, but this time it is all predictable and familiar. 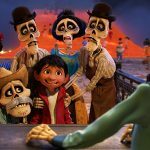 The maths homework, the boyfriend blues and the sleepless Dad struggling to run the household might be rare in animation and still unique in superhero movies, but not in family cinema as a whole. 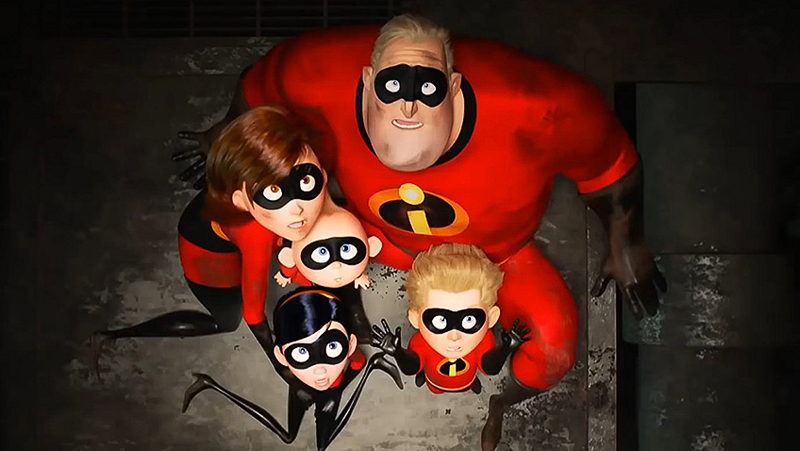 Despite retaining plenty of the fun of the original, particularly with the emergence of Jack-Jack, Incredibles 2 , overlong at just over two hours, feels more derivative (of the original and other superhero films) than exciting and fresh. When a new generation of minor superheroes is briefly introduced, each with a skill that we can hardly remember, it is difficult not to think of the X-Men franchise where keeping track of the characters and their gifts was a full time job. Since 2004 audiences have been inundated with superhero movies, and the action in Incredibles 2 is starting to blend in rather than stand out. Screenslaver might be a great villain for the target audience – a personification of the evil TV/computer/phone screens that can turn right minded, strong people into zombies – but its timing is a bit off. As a villain, Screenslaver might have been cutting-edge or premature in 2004, but in 2018, after a year-and-a-half of Donald Trump, and 12 years after the creation of Twitter, it is starting to feel old.